Hey, musicprenuer!This blog post was written by Manish Bhalia, founder and CEO of FATbit Technologies. As a budding musicpreneur, no doubt you are looking for a good business model you can sink your teeth into. This blog post will introduce you to seven viable models you could innovate on today. By the way, if you’re reading this now and think you might have the right stuff to contribute to The Music Entrepreneur HQ, you can find our guest post guidelines here. “The music model changed, and so did the revenue streams. Today, the music industry is more fluid and adaptive,” said Geoff Rickly, an American musician, best known as the lead singer and songwriter of rock band Thursday. As the music industry continues to evolve by leaps and bounds, musicpreneurs are zealously looking for new ways to push the creative boundaries of music. However, there’s a misconception that the music industry is only being run by a handful of tech giants with little to no room for startups to prosper in the cut-throat environment. 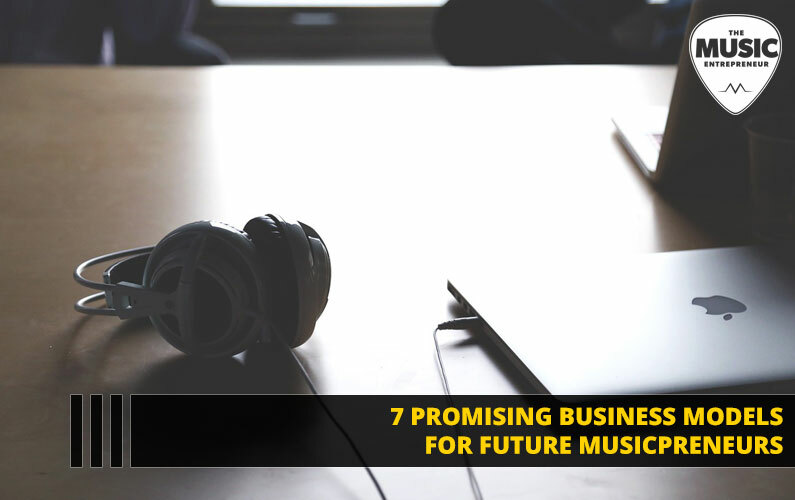 If you do a bit of digging, you can find plenty of information on various companies that are emerging in the world of music and making their mark through their standout business models. So, coming down to the nitty-gritty – is there any hope for entrepreneurs looking to build their own business in this industry? The answer is “yes”, but you’re going to want to choose carefully. Whether you’re a budding artist or someone looking to get started in the music industry, here are some promising business models you might want to look at to get started on your journey. Ticket fraud has become a bit of a problem in the music industry. Fans just want to go to see their favorite artist, but sometimes get lured into purchasing fake tickets or tickets at abnormally high prices. Smart ticket platforms exist to provide customers with a simple, transparent and secure place to book tickets of their favorite concert. These websites use blockchain technology to create a transparent ticketing ecosystem. One such website, which provides smart ticketing for popular events, is GUTS Tickets. It gives artists and managers a way to communicate directly with the fan before the event starts. It also automatically refunds the balance of a ticket when a fan cancels. Why this is an opportunity: There are an increasing number of blockchain powered startups and businesses launching in the music industry. Some believe blockchain is the panacea the industry has been waiting for. Whether it’s smart ticketing or music streaming platforms that reward artists fairly for their work, the possibilities are growing with each passing day. Gig marketplaces allow event planners to easily find performers or artists for their events, get a quote, negotiate rates and book directly through the online portal. You may have heard of GigSalad and GigMasters. They help event planners book musicians and DJs locally, while giving musicians an opportunity to find more gigs. Another site worth checking out in this space is Vivogigs. It’s the only platform that allows you to create your own gigs marketplace. We can see from the example of of these marketplaces that it may be possible to launch a marketplace exclusively for fraternities. Instead of competing directly with sites like GigSalad, you could niche down and find another worthwhile avenue to explore. Why this is an opportunity: You may not be able to duplicate what GigSalad or GigMasters has done, but if you can cater to a market that is currently being underserved, you may be able to capitalize on it. Now artists can make money, enjoy more control over their work and the ability to see all activity and income data related to their music. Check out Kobalt Music, a service that offers creators everything they need to succeed in this complex world of music. From music publishing, music recording, to neighboring rights, Kobalt offers a modern alternative to the traditional music industry. Why this is an opportunity: One of the prevailing issues of music distribution is that artists can’t see exactly how they’re getting paid or what sort of activity there is on the multitude of platforms their music is being distributed to. Solving this problem could add value to artists, especially if they can earn more from their art. Fans don’t just want to go to concerts. They also want to buy your music and merch. If only there was a platform where fans could go to support their favorite artists, and artists could go to sell their music and keep their fans updated. Fortunately, this does exist in the form of crowdfunding, and we all know how popular it has become in the last 10 years or so. In the music industry, we have PledgeMusic, a community of over 3,000,000 fans and 50,000 artists. Why this is an opportunity: Fans want to know who their favorite artists are. Any platform that gives them the opportunity to connect with their favorite acts on a personal level is sure to find some success. Sharing your work on social media can lead to exposure and even sales. Unfortunately, there are no guarantees. But what if there was a place where you could share exclusive content with the most diehard of fans? Patreon is one website that facilitates this type of interaction. It has over two million active users and 100,000 monthly visitors. Patreon’s business model is essentially based around crowdfunding. Where it differs is that it gives fans the opportunity to offer small amounts of money to their favorite artists on an ongoing basis while artists can give their fans access to exclusive content they won’t find anywhere else. Why this is an opportunity: 300 hours of video are uploaded to YouTube every day. And, two million articles are published on the web daily. Do you think there might be a way to capitalize on the many creators who are seeking attention online? Avid is most known for Pro Tools, the industry standard Digital Audio Workstation (DAW). But in many ways, Avid has become the Adobe of the music industry, developing and providing tools for musicians, composers, engineers and producers. From Sibelius to Media Composer, Avid’s offerings continue to expand, providing creative professionals with the tools they need to succeed. Why this is an opportunity: It’s one thing to create a tool – quite another to develop a suite of tools that can be the mainstay on a creator’s computer. Is there a specific category or market you could dominate? For better or for worse, mainstream radio is laden with top 40, and you can hardly get away from it. But what if there was a platform metal lovers could go to hear their favorite songs? Fortunately, niche radio has become increasingly popular as more fans embrace their musical interests. Gimme Radio is just one example of a platform that focuses on a beloved niche, and it mostly earns its revenue through selling merchandise and vinyl. Why this is an opportunity: People are still using a variety of platforms to listen to, and discover music. If you can find a niche that’s underserved and leverage the popularity of certain personalities, you could do exactly what Gimme Radio did and create a go-to place for a certain type of music fan. There are many promising business models out there. But don’t just copy what others have done. Innovate on it. Or, find a niche that has yet to be exploited. Use your imagination to come up with creative ways of appealing to a specific target market. If you have a unique business idea for musicpreneurs, let us know. You can comment below.